Among those doing excellent work on G. K. Chesterton is Joseph Pearce, the brilliant Brit who is a scholar at Ave Maria University in Naples, Florida. Pearce, like Dale Ahlquist, is unearthing all sorts of gems from Chesterton’s writings. Pearce recently came to Grove City College in Western Pennsylvania, where he offered an intriguing European perspective on American exceptionalism (click here for video). Among the Europeans that Pearce was sure to include was Chesterton—and what he said is fascinating. In my view, it’s as poignant as the richest lines on America from Frenchman Alexis de Tocqueville. Pearce notes how when it came to America, Britain, the West, and Christianity, Chesterton, as usual, was ahead of his time. He foresaw a faith in rapid decline in Western Europe, and felt it might be left to America to pick up the torch for Christendom. Hilaire Belloc, a friend of Chesterton, famously remarked that Europe is the faith and the faith is Europe. That was true then, but not today. Wow. Think about that line: “by whose stars we are illumined, and by whose stripes we are healed.” Have you ever thought about your flag that way—so Christ-like? 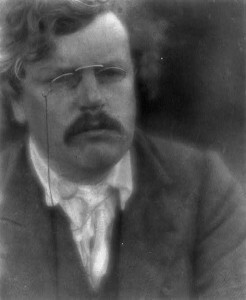 G. K. Chesterton did. It’s a stirring interpretation of America and its mission. America and Europe have gone in opposite directions faith-wise. Despite our serious problems—the Death Culture chief among them—the vast majority of Americans remain believers, and Christians, and we provide more missionaries than any country; including to Europe. As we again mark the birth of America’s founding, may those stars still illumine, and may those stripes still heal. Paul Kengor is professor of political science and executive director of the Center for Vision & Values at Grove City College. He is also co-author (with Patricia Clark Doerner) of The Judge: William P. Clark, Ronald Reagan's Top Hand (Ignatius Press, 2007).